A common request from our customers is like follows. They have created an ASP.NET website and they want to allow their users to print barcode thermal labels to their local /client-side thermal printers. The request goes to the point that some of them, do not want to show any print dialog to the user but just directly print to the default printer without any intervention. 1. You code your website to create WebPrintJob objects based on your business needs. That WebPrintJob can be created in an HTTP Generic Handler (ASHX) or in a MVC Controller. 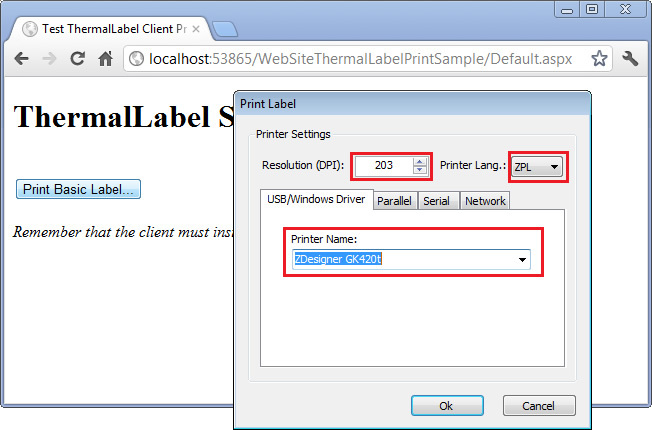 A WebPrintJob object contains info about the ThermalLabel object (that's the layout of the label containing text, shapes, pictures, barcodes, etc), the number of copies to be printed and the client printer settings (or you can display a print dialog and let the user to specify the printer settings). When the user requests your ASPX Page or MVC View, you provide him with a button or link (it would be the "print label" action) which when clicked by the user, it will launch the TLClientPrint utility (which must be previously installed in the client machine). 3. 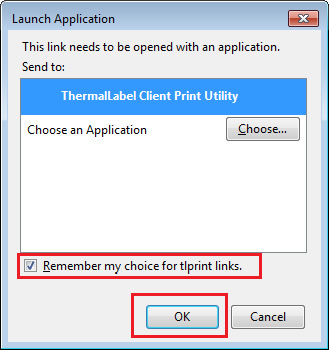 The TLClientPrint utility will pass all that info to the ThermalLabel SDK which in turn will generate and send the printer commands to the specified printer (*). It is important to note that the whole job is done at the client-side, freeing the server resources and taking advantages of the processing power of the client machine! You can already send all the client printer info through the WebPrinterJob's PrinterSettings property. Of course, you need to know many aspects of the client printer like the communication type (USB, Serial, Parallel or Network printer), the name or other related info like IP/Port, if it is Zebra ZPL or EPL capable or a Honeywell-Intermec printer, etc. In some enterprise scenarios this could be easy or manageable as there could be a set of identical printers in most client locations. In other scenarios, you could request the user to provide his printer info once, and then you could store such info somewhere and use it afterward. 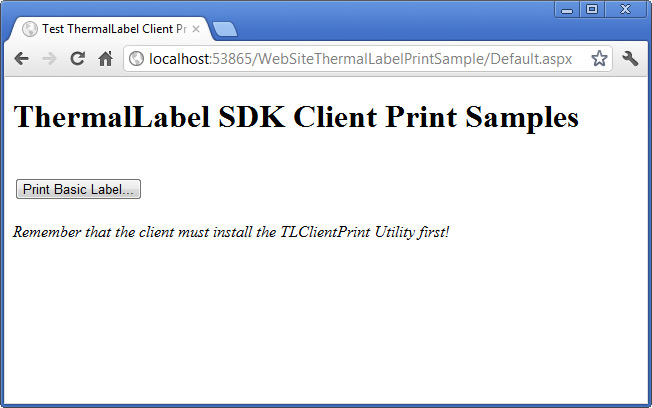 You can also instruct the TLClientPrint utility to directly print to the default printer in the client machine. In this case you must be sure the client has the correct thermal printer set as the "default printer" but keep in mind that you still will need to specify if Zebra ZPL or EPL, or Honeywell-Intermec Fingerprint commands need to be generated as well as the DPI value supported by the client printer. The following sample demos how to use the new WebPrintJob class and the TLClientPrint utility. We'll create a simple ASP.NET website featuring a page with a button. Such button will start the client side printing process by invoking the TLClientPrint utility which must be previously installed in the client machine. We'll show the user the default Print Dialog to print a simple thermal label which features a text and a Code 128 barcode. Please download and install ThermalLabel SDK if you don't have it already installed in your dev machine. Open Visual Studio and create a new ASP.NET MVC website. 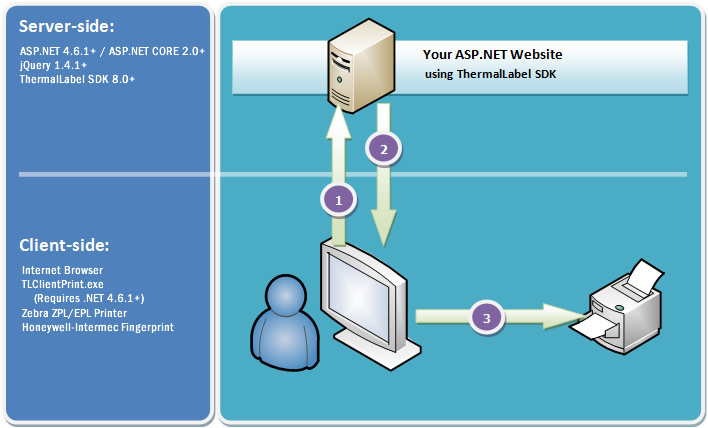 In the ASP.NET project, add a reference to Neodynamic.SDK.ThermalLabel.dll and Neodynamic.SDK.ThermalLabel.WebPrinting.dll which are located in the installation folder of the product. Now, we'll code our website. Remember it is a simple page with a button that when clicked by the user, it will start the client side printing process. This code features the printThermalLabel() function which will be invoked by the button on the aspx page to start the client printing process. When the user clicks the "Print Basic Label…" button, it's likely the browser will display some dialog to him. This is ok as the button is trying to launch the TLClientPrint utility. Here is some screenshots of the possible dialogs displayed by the most popular browsers. You can instruct to the user how to do this once by specifying the correct values on those dialogs. For Internet Explorer users, instruct them to uncheck the "Always ask before opening this type of address" and click Allow button. 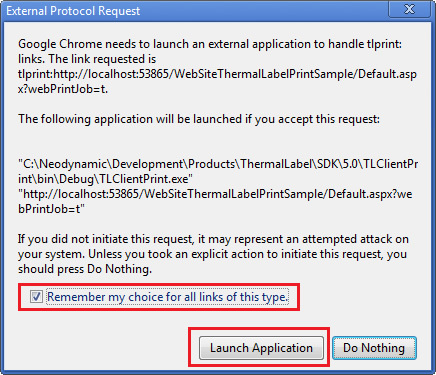 For Firefox users, instruct them to check the "Remember my choice for tlprint links" and click OK button. For Chrome users, instruct them to check the "Remember my choice for all links of this type." and click Launch Application button. The user is asked for his printer settings like DPI, printer language (ZPL, EPL or Fingerprint) and in this case the Windows Driver name. Again, remember that you can print directly to the client printer without displaying any dialog but you need to know all the needed info about the client printer before doing such thing. After user click Ok button, the ThermalLabel object you created in your ASP.NET website will be printed to the client printer! 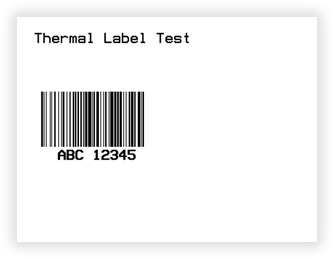 The barcode thermal label which will be printed to the client printer.